Reusable single serve coffee filter system has been universally designed to fit all coffeemakers using the K-Cup technology, including Keurig, Breville, Cuisinart and Mr. Coffee. A great alternative to disposable prepackaged coffee packs. You can use your own coffee in your brewing system and save some money! 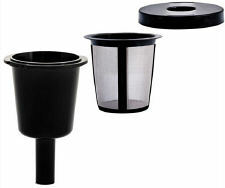 Package includes: Filter, Filter Housing and Lid.